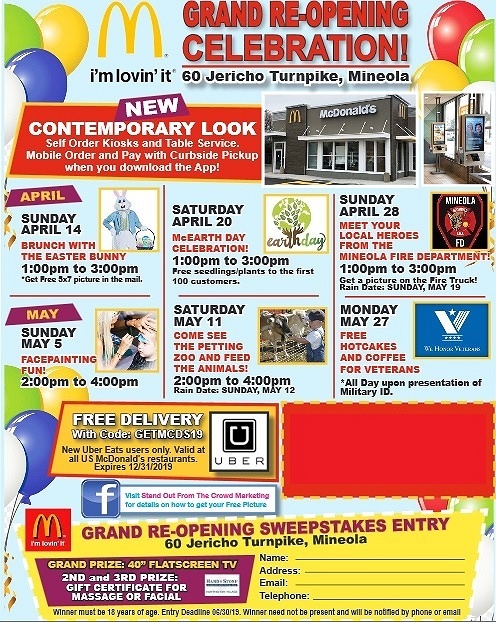 Subject: LongIsland.com - Your Name sent you Event details of "Free Hotcakes & Coffee for Veterans - McDonald's Mineola Grand Re-Opening Celebration"
McDonald's Mineola will be celebrating their grand re-opening with a variety of family friendly events throughout April and May. Veterans who present their military IDs on Monday, May 27th will receive free hotcakes and coffee. The restaurant's amenities have been upgraded to provide customers with the absolute highest-quality experience. 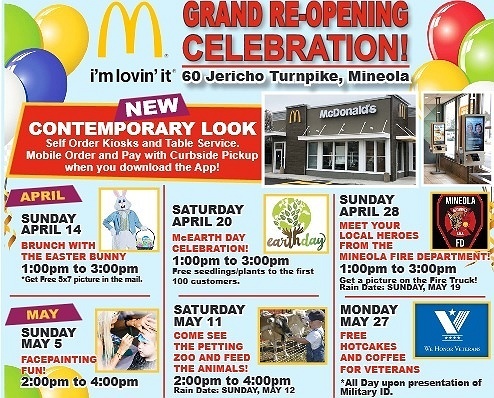 In addition to a contemporary look, there are now self-order kiosks, table service, and mobile order with curbside pick-up.